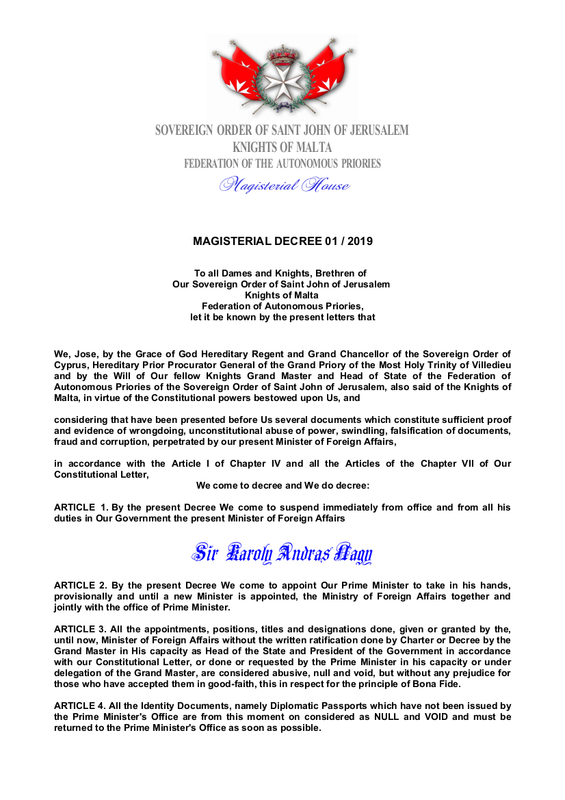 By the Magisterial Decree nº 01/2019 (see the document below) We come to suspend immediately from office and from all his duties in Our Government the Minister of Foreign Affairs, Sir Karoly Andras Nagy, aka "Sir Charles". By the present Decree We come to appoint Our Prime Minister to take in his hands, provisionally and until a new Minister is appointed, the Ministry of Foreign Affairs together and jointly with the office of Prime Minister. All the appointments, positions, titles and designations done, given or granted by the, until now, Minister of Foreign Affairs without the written ratification done by Charter or Decree by the Grand Master in His capacity as Head of the State and President of the Government in accordance with our Constitutional Letter, or done or requested by the Prime Minister in his capacity or under delegation of the Grand Master, are considered abusive, null and void, but without any prejudice for those who have accepted them in good-faith, this in respect for the principle of Bona Fide.